Yay! It's hot again in Georgia....sense the sarcasm. But, this special treat is sure to cheer up anyone that tries it. My husband is lactose intolerant, so there aren't a lot of ice cream options for him which means I don't usually buy it for myself because it goes to waste before I can finish it. In the long run this is a good thing, but every once in a while I like to have some ice cream. This one covered all the bases for me! It's hard to ever have the same consistency as real cream because the fats in cows milk really make ice cream rich and creamy, but using coconut milk comes pretty close. In a medium bowl add raspberries and sugar. Crush with the back of a spoon (or a potato masher). Set aside for 15 minutes and let the juices come out. In a large bowl combine eggs, milks, and vanilla. 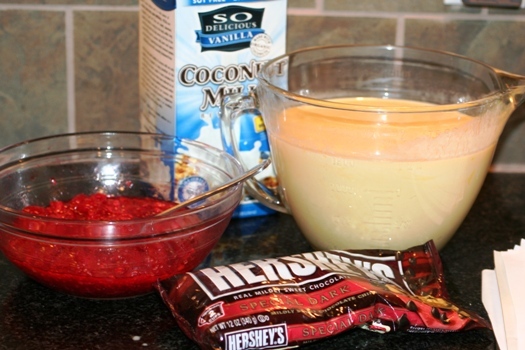 Add raspberries and chocolate and stir. Pour into an ice cream maker and enjoy!